Windows Software that Generates Several Types of Spectrograms of Music: Both from Live Sound and from Recorded Sound, with Many Features for Musical Aural Feedback (MIDI notes, Sing-Along pitch overlay), Other Features to Aid in Chord and Key Recognition, as Well as Some Other Features to Support an Understanding of How Overtones Relate to Perceived Musical Sound. However, some may prefer the Spectratune software on this page, if needs are limited to live sound, as the interface is substantially simpler. -- Displays In Real-Time For Any Sound Going Through a P.C. Screenshot 1 (Above) -- Note this is a still shot of the software's displaying "motion picture" of the sound as it changes over time. The screenshot was taken with my electronic keyboard feeding my computer sound-card as device 1. I also happen to be listening to that keyboard with headphones, and humming along and matching pitch into my webcam microphone, which is set as device 2. Because the keyboard generates the sax with a little vibrato, if you watch the fundamental and its overtones in motion, they actually move up and down in complete synchrony by about a 1/5 of a half-step. At the moment I snapped the screen shot, the vibrato was putting the true frequency just a tad above the note. If you were using the blue spectral display above to check tuning or intonation, you would look for the lowest overtone to get the exact note, rather than an overtone. As I indicated, I was humming along trying to match the note in the webcam microphone when I took the shot. I am only running the single-pitch detection on the webcam microphone channel -- no spectrogram. The single pitch detection is showing as the yellow arrow. It is picking up only my humming and not the keyboard because I am listening to the keyboard through headphones. The ear actually works much like the spectrogram. There is a long curled thing in the cochlea of the ear called the basilar membrane that vibrates at different sections corresponding to the fundamental and all overtones present. Several thousand nerves transmit information to the brain about what sections are vibrating. The brain then puts together single sounds basically by method (b) above. With my software, you won't be able to do as good a job at putting things together as your brain does with the ear, partly because my software doesn't respond as quickly as the basilar membrane and auditory nerves. But you get some idea what it does by looking at the software. For deaf folks with auditory nerves still intact, a cochlear implant actually works by taking something like the signals from a scattering of points across the spectrogram, and sending them to the appropriate nerves along the basilar membrane. Some may think the spectrograms (whether from my program, or another spectrogram program) are defective because the overtones don't show on the graph in one sharp point, but rather are a little spread out. But that actually parallels what's going on in the ear on the basilar membrane -- which is again the data that the brain gets. The basilar membrane won't vibrate in just one precise point (even if fed a perfect sine wave), but will vibrate in a small zone, with the amount of vibration peaking at one point. The ear doesn't work by detecting absolutely precise sine waves -- it works by picking up where the basilar membrane is vibrating and figures out the pattern. As a technical note, spectrograms work by breaking signals down to sine waves. One might wonder what is the significance of the sine waves -- why sines, isn't the choice by all those engineers of that mathematical sine shape arbitrary? No, it's not arbitrary. It works out that that's what the ear, at the basilar membrane, picks up. It vibrates at sections acording to what sines are present. By the way, if you've downloaded the program, to move any of those 5 "sliders" (of which dynamic range is one), you just left-click on where you want to be on the slider. 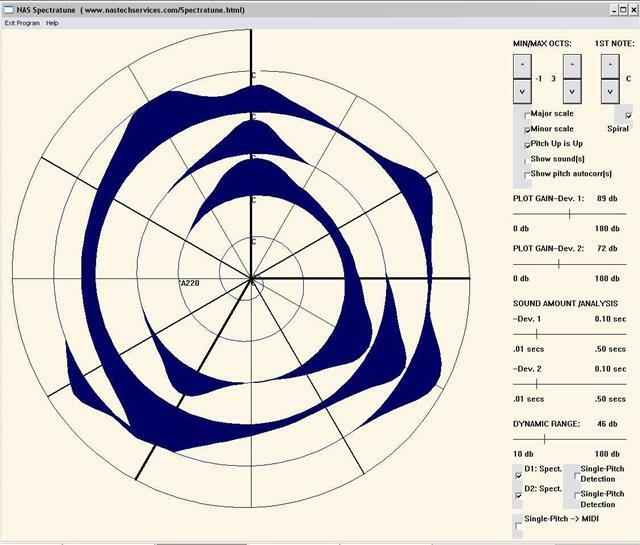 Screenshot 2 (Above; Spiral Mode) ( This spiral form of display may be more useful when the key is unknown, and also for chords and music theoretical/psychoacoustics exploration and theorizing.) The particular example is of a major tonic triad. the fundamental and overtones that the music theorists refer to are all, precisely, sines, though they rarely say it, and perhaps some do not know that detail. The most important reason overtones are defined this way is that sines are what the ear hardware breaks sound down into. I have a little more on that on my old pre-made spectrogram video page. My Spectratune's, and all common spectral analyses, display their output in terms of that same sinusoid "basis", which is the one relevant to hearing. Also, the exact frequencies are: A right below middle C has a fundamental that is a sine of 220 cycles per second. Each time you go up a half-step, you multiply this by the 12th root of 2 (about 1.059463094359), down a half step, divide by the 12th root of 2. In each case, the harmonics are sines (in varying strengths, dying out as you go up) at 2 times the fundamental frequency, 3 times, 4 times, 5 times. Thus, the B right below middle C has a fundamental of 246.94 cycles per second, with harmonics 493.88, 740.82, 987.77, etc. DETAIL: This way of determining notes is the common standard way, called the tempered scale. Sometimes instead of the A below middle C being 220 cycles per second, it is a few cycles different. My Spectratune uses 220 as the default, but this can be adjusted. (People familiar with the science of hearing will note that what you are looking at in the spectrum output (but not the single pitch arrows) is basically the raw data that the brain gets from the ear. However, there is one limitation--the ear puts out data, and the brain processes it quite quickly, perhaps every thousandth of a second. With my Spectratune, you will only be able to get perhaps 5 or 10 or 20 pictures per second, depending on your computer, and the exact way you have the Spectratune adjusted. You might also want to know that the single-pitch detection, which is the second type of analysis from the Spectratune, which does give a precise point of pitch (of the fundamental of a single musical note from a single instrument or singer) does NOT work like the ear. It works differently, getting data that the brain does not get from the ear, but that the computer does get. Its the perfect thing to track pitch of a single instrument or singer, or to tune an instrument, but it happens to work using specific data that the computer gets from the microphone -- air pressure level very precisely in time -- that the brain does not get from the ear. What you're doing with the spectratune (tuning an instrument, checking your voice intonation, looking at intonation of notes on a recording, studying timbre, etc.) will affect how you have things set. In general, to speed things up (and show a quicker, "more responsive" picture-rate), you can either reduce the number of tasks being performed, or do an adjustment which in some sense reduces the detail of the analysis. Here are the adjustments that trade-off speed vs. detail. Note that in many cases, depending on what you're doing, a lot of speed can be gained with only an imperceptible loss in detail. 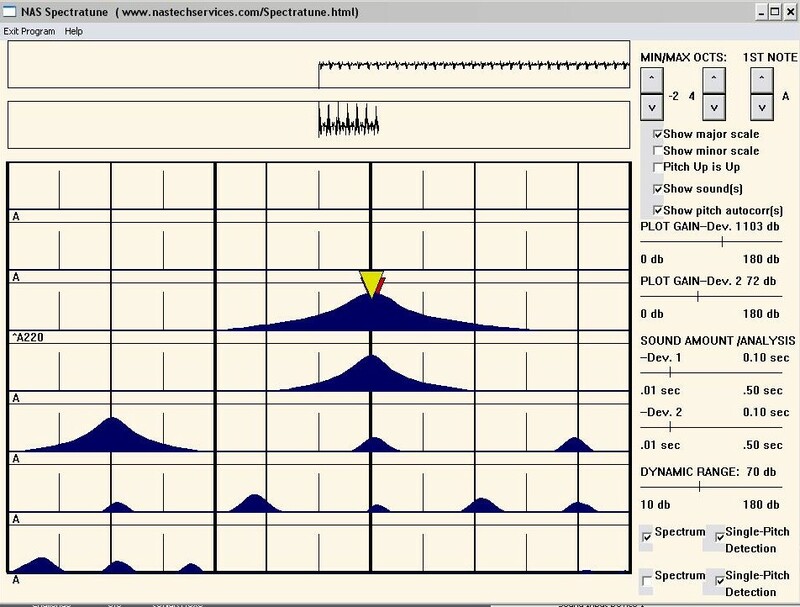 Sound Amount / Analysis: Like virtually all sound analysis software, the Spectratune takes a small duration of sound, and analyzes it. Lengthening the duration increases the sharpness of the spectrograms (including quicker descent away from the center of the note), and also gives a bit more precision to the single-pitch detection. However, the tradeoff of lengthening the duration is slower response, that is, less frames per second. Note that the general sharpness of the spectrograms only (not the single-pitch detection) is a function of how many cycles of the tone in question that you look at. For a fixed amount of sound / analysis, higher tones have more cycles and are shown more sharply in the spectrogram. The single-pitch detection behaves a bit differently than the spectrogram, in that you always need at least about two cycles of the sound in the amount per analysis--otherwise it won't work, but enlarging the sound amount in the analysis won't usually do any additional good. In the analysis displayed above, I have used a .10 second analysis sample time. NOTE: Typically a users needs will be handled with sound amount set anywhere in the .05 to .10 zone. Device Sampling Rate and Undersample. The device sampling rate is how many readings of sound level your device (sound card, web-cam mike, etc) is sending out every second. Without an undersample set, the program will use every one of those readings in the analysis. The higher the device sampling rate, the more accurately the signal going in represents the sound, but the slower the analysis. The lower the frequency, the less important this is. Undersampling is simply a way of making the program act like the device is sampling at a lower rate. You lose some precision, which is less important at the low frequencies, but gain some speed. NOTE: Typically, I use a device samping rate of 11.025 khz (lowest available on my system), with a 2X undersample. Equivalent to this is to use twice the device rate and a 4X undersample, etc. If you have too high a device rate or too low an undersample, the program will take longer than you probably want to display each update. 2013.09.23: Fixed calculational error in relative power calculations. (Previously, relative decibels between different tones were scaled about twice as high as actual, due to a long-standing typing error in the code. That is, the frequencies and picture of the spiral were correct, but labelling of relative power in dB according to the graph scales were incorrect, and about double the actual value. 2009.09.10 (actually, 2009.07.10 is the date--I goofed on the date code and am too lazy to fix it): Improved show minor/major buttons so that when one is pushed, if on, the other goes off. Added link for on-line help (under HELP menu item).